That's Mount Everest, right there. 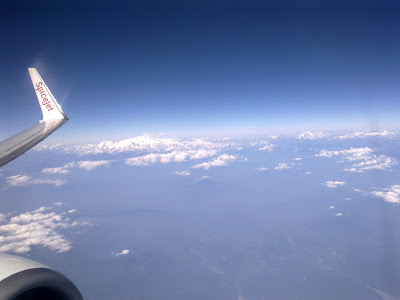 It seemed weird that my first view of that giant of mountains was from above. I've been having the greatest of luck in 2011: may it last. I've flown Delhi-Guwahati a dozen times, and never seen anything near this. Thanks to the pilot who called it out: else I might have been looking down at my book or looking out without fully appreciating the grandeur of what I was seeing. Now, a quiet evening at home with my mom: something I've imagined for years but never seemed to have got right. Tomorrow: my niece, who told her mom she wanted us to visit right away. I'm scared she won't recognize me: won't remember the aunt whose arms she so eagerly jumped into two years ago. I'm scared she will be too grand to condescend to notice me. wow! looks breathtaking! Yes, you are lucky! Yes it's amazing! I took a very similar picture on the way to Sikkim in November, my first trip ever, and I remember being told it was a rare sight. aurpera: Thank you and welcome, new commenter! Your profile looks very interesting. IHM: And I wasn't even going to the mountains. The fact that it was so very unexpected made it so much more magical.